An economical colorant, that indicates to the applicator where the pesticide or fertilizer mixture has been sprayed. Mixes easily with any ingredient and won’t harm efficacy or functionality. The product is used in many different situations which call for dyes or colorants. The blue color makes it highly visible on many natural surfaces. SHAKE WELL BEFORE USING. 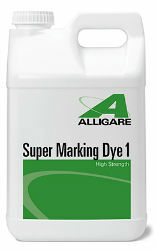 Alligare® Super Marking Dye 1 rates will vary depending on such conditions as background color and texture of the area being sprayed, weather conditions, etc. Start at the low rates and work up.